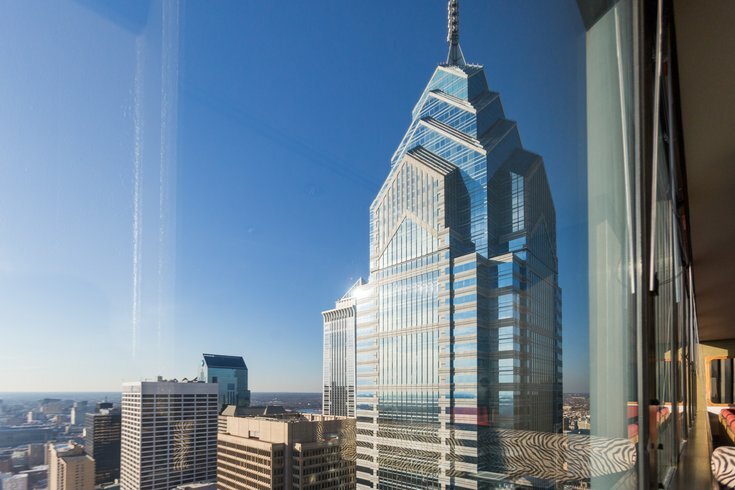 For many years, one of the most prominent buildings in the Philadelphia skyline has been One Liberty Place, this view was taken from Two Liberty Place. Philadelphia's population boom in Center City has been going strong since the turn of the century. From 2000 to 2015, the city's urban core saw a population increase of 16 percent to more than 183,000 residents, a trend that will continue as East Market and other residential projects add downtown density. A new infographic from local commercial real estate services firm JLL offers a more complete picture of which neighborhoods are seeing the greatest residential expansion (this interactive map will prove helpful for matching up neighborhoods). Population growth in Center City (2000-2017). JLL's definition of Center City, which covers 11 zip codes, extends beyond the generally accepted boundaries adopted by Philadelphia's own Center City District. The CCD's population numbers are based on the Central Business District, which defines Center City as the area surrounded by South Street to the south, the Delaware River to the east, the Schuylkill River to the west and Vine Street to the north. The numbers provided by JLL also include neighborhoods like Northern Liberties, Fishtown, Kensington, Brewerytown and Sharswood to the north, while the South Philly data extends to Point Breeze, Gray's Ferry, the Italian Market and Pennsport. "We wanted to use a broader definition of Center City so that we can account for the growth of infill housing in neighborhoods like Brewerytown and Kensington," said Lauren Gilchrist, JLL's vice president and director of research. "We know that the Central Business District has about a 40 percent live-work-play relationship, so we tend to focus on that area from a commercial standpoint." Using JLL's expanded territory, population estimates for 2017 put the total number of Center City residents above 267,000 in the 11 zip codes in the infographic above. A closer look at the data reveals that Center City's population was roughly even at about 130,000 people on both sides of Broad Street in 2017. The zip codes that have experienced the most growth, however, are predominantly on the east side. 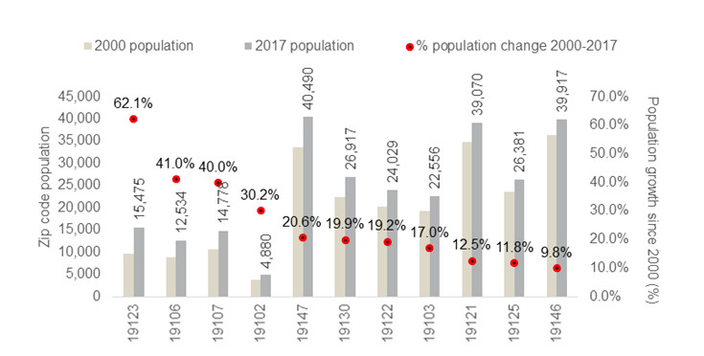 Northern Liberties (19123) saw an incredible 62 percent increase in population during the period in question, while the populations of Chinatown (19107) and Market East (19106) grew by 40 percent. South Philadelphia neighborhoods still have a much bigger population, however, because of the density of their rowhomes and the size of the zip codes (19146, 19147) under which they fall, though Brewerytown (19121) isn't far behind. Gilchrist said the urban core will see continue to see rapid growth in the coming year. Over the past five years, 7,500 multifamily units were added to the CBD. Another 3,000 units are expected to deliver in 2018 alone. "Much of this is still driven by millennials," Gilchrist said, despite evidence that growth in this group might be flattening. "The millennial population grew by 41 percent over the last decade. There's an idea that more millennials are moving to the suburbs. My feeling is no, but we'll see what happens in the future."